Fabulous. I don't know if I've ever enjoyed a 'classic' more. Kinglake reminded me a surprising amount of Bill Bryson, in tone if not in verbosity. 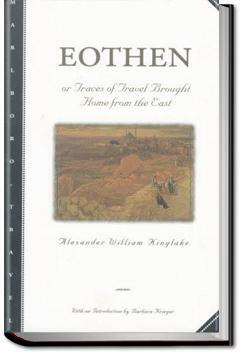 A trip through the middle-east in 1850, Not a travel book at all. He just described, hilariously, exactly what he saw and heard. The writing is fresh. Worth reading just for his descriptions of what people wore before Nike and Levis ruled the world. أدب الرحلات، ورحلة إلى المشرق العربي .. رحلة ممتعة بين سوريا و الأردن و فلسطين و مصر .. تحكي أحوال الشرقيين وطبائعهم ، و عن تعصب المسلمين وحقد المسيحيين ونفاق اليهود .. كُتبت كمذكرات تصف ما يراه السائح وما يشعر به .. تستحق القراءة . الكتاب خيب أملي توقعته افضل من ذلك بكثير. This is a graceful, provocative book with some startling sentences. It is one of those books that challenges you to rethink the familiar. I have frequently quoted his reflection on the use of middlemen vs. market bargaining to determine the value of goods.